Snow Shoveling? Don’t forget to breathe! As I was shoveling yesterday for the umpteenth time this winter, I was thinking once again about snow shoveling injuries and prevention. One of the things I found myself doing during our first snowfall of the season (back in OCTOBER! ), which I imagine is the case for most of you as well, is holding my breath while picking up my shovelful of snow and tossing it. As soon as I realized what I was doing, I corrected my breathing. So how should you be breathing? As with any of the exercised we do in class, I tell you to exhale on the hard part, starting the exhale before the hard part begins (for example, starting your exhale before you stand up from a squat). In snow shoveling, the hard part is picking up the shovelful of snow and tossing it. Intraabdominal pressure builds up when we inhale, which is a good thing as it stiffens our spines and helps prevent injuries. But holding your breath while exerting a lot of effort is a great way to hurt yourself. That pressure needs to go somewhere and if you have a weak spot, say your back, your abdominal muscles (hernia anyone?) or your pelvic floor, that weak spot will continue to get strained until something bad happens. To prevent that bad thing from happening, you strengthen your core – abdominals, back muscles, pelvic floor – and you breathe properly. Inhale, drive the shovel into the snow, start your exhale, pick up the shovel and toss while exhaling the rest of the way. Here are some more tips for proper snow shoveling form. All good things. Hopefully, we are done with the significant snowfalls for the season, but being in Minnesota where March is the 3rd snowiest month, I’m not holding my breath! 10 Years and Counting! Happy Anniversary to Forza! As of the end of last month, Forza! has been in business for 10 years! Hard to believe, as the time has gone so quickly. For those of you who have been with me from the beginning, thank you very much for your support! For those just joining us, welcome! Back in January of 2008, we started with mostly kettlebells, pull up bars, a few exercise balls, some jump ropes and a lot of space. Along the way, we’ve added TRX and TRX rip trainers, Surfset Surfboards, Gladiator Walls, Battling Ropes, Bulgarian Bags, lots of other types of balls as well as a few other miscellaneous “toys”. We’ve also added new techniques: Resistance Stretching, Original Strength Resets, Functional Movement Screens, and newly added Postpartum Corrective Exercises (much of which actually applies to all of us, including men). It’s been very rewarding to find ways to help all of you get stronger, become more resilient, and build body awareness. I’m looking forward to continuing working with all of you. I will keep adding new things (a new piece of equipment to help build glute strength should be arriving soon) and keep looking for ways to make our workouts more productive and fun! Here’s to the next 10 years! May we all see even greater returns on our investment in our health and fitness! Last week there was an article in the Star Tribune Taste Section about fermentation called “Take your veggies to funkytown.” It includes a recipe for sauerkraut as well as one for pickled carrots. Why ferment? Fermented foods are good for your gut, they are nutrient dense and those nutrients are more available to you after they’ve been fermented, and finally, they add flavor complexity and variety to your diet. The brine from your veggies can even be added to soups and sauces! I’ve recently begun experimenting with fermenting my own veggies. So far I’ve pickled whole radishes, shredded beets and this morning I started a batch of shredded sweet potatoes. For those of you who might be intimidated by the process, let me assure you that it is incredibly easy, especially if you invest in a few time saving, specialized pieces of equipment. You can buy a starter kit for just over $21 that even includes the salt. You supply the veggies and the mason jar. Starting with any veggie or combo of veggies you like (with or without any additional flavorings like herbs) chop, dice, slice your veggies in whatever format you like and pack them into a mason jar so your veggies fill nearly to the top. Mix up some salt water (this is the only tricky part especially if you don’t like salt). There are lots of recipes on-line you can follow for how much salt to use, but I just add some (1/2-1 tsp) salt to a couple cups of water and taste, adding more salt or water until it is as salty as I like and then pouring over the veggies. If you don’t get it salty enough, your veggies will not ferment. If you get it too salty, you will have overly salty veggies. Don’t get too worried as there’s a pretty big margin for error here. If you didn’t buy a kit with the salt included, make sure you buy a high quality salt like a Himalayan or Celtic Sea Salt. Yes, this matters. Don’t use Morton’s or any other iodized salt! Once you have your veggies completely submerged in salt water, add your glass weight to make sure they stay under the brine and place the lid on your jar followed by the airlock filled partially with water. Place your jar in a shallow dish in case it leaks (they tend to do this), then you can leave your jar on the counter or put it away in a cupboard and forget it for a week. After a week, start tasting. When I fermented whole radishes, I left it for at least two weeks. When your veggies are cut into smaller pieces or are a softer veggies like green beens, they ferment faster. When they are fermented to your liking, place them in the refrigerator. The cold will stop them from fermenting any further. Then eat them right out of the jar or add them to salads, sandwiches, soups…! Here’s another great article on exercise and brain health, entitled “A Lift to Brain Power“. I’ve posted articles in the past talking about the benefits of exercise on the brain. Most of those studies were done using aerobic exercise. This study focuses on the benefits of resistance training in staving off the lesions that occur in the brain over time and that are linked to memory problems and cognitive impairment. In this study, women ranging in age from 65 to 75 were placed into three groups. All three had brain scans done prior to starting the study as well as testing on walking speed and gait pattern. As we age, our muscles weaken which in turn causes our gaits to slow and become less stable, possibly contributing to declining brain health. One group was assigned light resistance training one time per week, one group was assigned light resistance training for two times per week and the final control group was given a stretching and balance routing two times per week. All these women continued their training for one year. What the study showed was that while all three groups still showed a progression in the number and size of lesions in the white matter in their brains, the group who were assigned resistance training two times per week had significantly less white matter shrinkage than the other two groups. 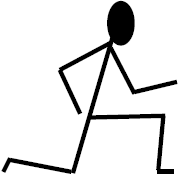 In addition, their walking speeds were faster and their gait smoother than the other groups. All of this is good news for those of you coming in to Forza! twice a week. It should be a wake up call for those of you who are less faithful in your exercise routine. I’m all for walking or running, especially outside, but it is not enough! We need the extra muscle building and brain protection provided by resistance training. Let’s hear it for those squats! When I first started Forza! I would perform each and every exercise along with each and every one of my classes. 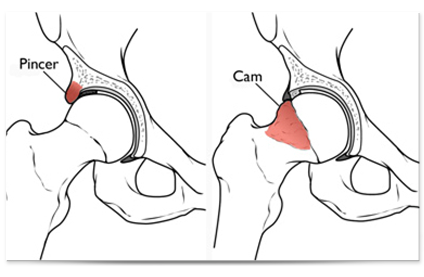 After a year or so of running my classes that way and, in particular, repeatedly performing a sideways walking kettlebell swing in multiple classes per day, several days in a row, I developed what I now know was an FAI (femoral-acetabular impingement) with a labral tear. In English it simply means the cartilage in my hip socket was getting pinched between my leg and hip bones and leaving some tears in that cartilage. This is a common overuse injury for athletes, but there was another factor that I discovered much later that I believe contributed to my injury. I’ll get to that in a bit. FAI symptoms are rather vague and it took me several years to figure out what was going on. I sought treatment with a Sports Med doctor, multiple chiropractors, an acupuncturist and read everything I could find on-line related to hip pain. Over the next four years, my hip felt better at times but was never completely pain free. Last year it got really bad after a fall on a slippery slope that bruised my tailbone and kept me from doing any hip hinge movement (required in most of the exercises I do). I had finally had enough. I wanted some answers. I went back to the Sports Med doctor and got an MRI to tell me what was going on. After being diagnosed with the FAI, the first step in my treatment plan was a cortisone shot in the hip. Let me tell you, neither the MRI or the treatment was fun to do. They both involve a very long needle being inserted deep into the hip socket and then the injection of dye or cortisone into the hip. So I had the cortisone shot and it did give me some relief, but only for a couple of months, and I did not want to go through that again as it was painful, expensive and not a long term solution. I was also not thrilled with the idea of surgery, the recommended next step. I was back to just living with the pain, now knowing what was causing it, but not able to fix it easily. Then along came Marjorie Brook. We were both attending an Original Strength (OS) Level II workshop in North Carolina in February. 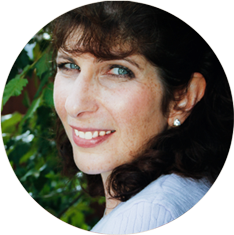 When I found out that Marjorie worked on scar tissue release, I was intrigued. I have a C-section scar that is 19 years old, but never really thought much about it. No one mentioned it as a possible contributing factor in my hip pain, and why would they? The hip pain started over a decade after the C-section. The OS staff let us borrow a small storage room where we set up a message table and for about 15 minutes, Marjorie worked on my scar. She told me that the scar was thicker on my right side, the side that was injured. Marjorie has a gentle touch, but it is still painful, like the snake bite your friends would give you in elementary school where they twist the skin on your arm in opposite directions. Just in that short amount of time she worked on me, I could feel a difference, not just there, but throughout my whole body. I came off the table and walked around a bit, then we did some OS resets and Marjorie spent some time helping me figure out how to stand upright again. I believe the scar had been pulling my rib cage down toward my right hip and messing up the ligaments in my hip a little bit, making my hip less stable and more likely to get injured. Who knew?! Since that time, I traveled to Long Island to get more work done on my hip and after about a month of adjusting, I can honestly say most of the time my hip pain is completely gone. I don’t have that constant ache and even when I do notice some pain after a strenuous workout, I now know how to stretch myself out of my hip, do my OS resets and the pain goes away again very quickly. No more painful shots. No surgery needed. Wowsa! Three cheers for Marjorie! 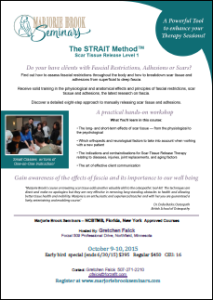 I am so thrilled with Marjorie’s work and want to help spread the word about the effectiveness of Scar Tissue Release Therapy, that I’ve invited Marjorie to Minnesota to present a workshop for Therapists on October 9 – 10, 2015. Click below for the workshop details. The early bird discount ends on June 30th and Marjorie is also offering a free cervical spine stretching download for the first 10 people who sign up. Great incentives to act fast. I know you won’t regret it. 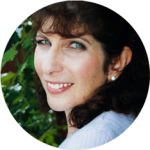 If you are not a therapist, but have a scar you’d like worked on, Marjorie will also be available on October 11th to work with individuals. I highly recommend it! If you’ve been reading my posts, you know how much I value the workshops put on by Original Strength. If you haven’t had a chance to attend one (and I can’t recommend it strongly enough) you have another opportunity coming up in July. Attend if you can. You won’t regret it. The last few weeks have been busy for us at Forza! with continuing education classes. 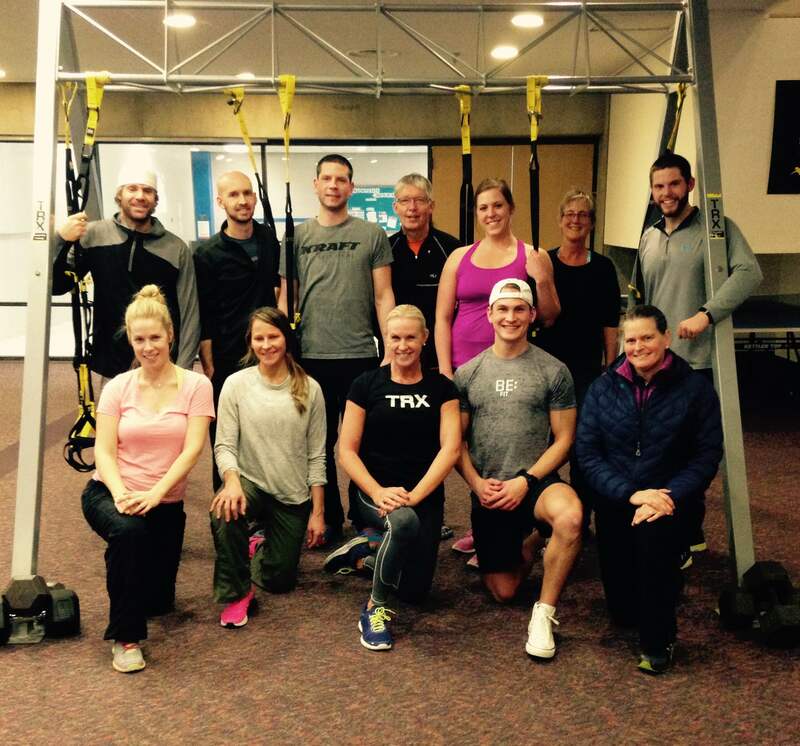 Dean completed a TRX Group Training Certification course (way to go Dean!) and I spent two of my weekends learning new things to share at Forza! The first was a two day course put on by the US Track & Field Assoc. on Strength and Conditioning for Track & Field. Although most of my clients are not training to compete, the workshop still provided some interesting information that can be applied to my classes at Forza! as well as the high school athletes I work with individually. I’ve incorporated a few of these into my classes already. 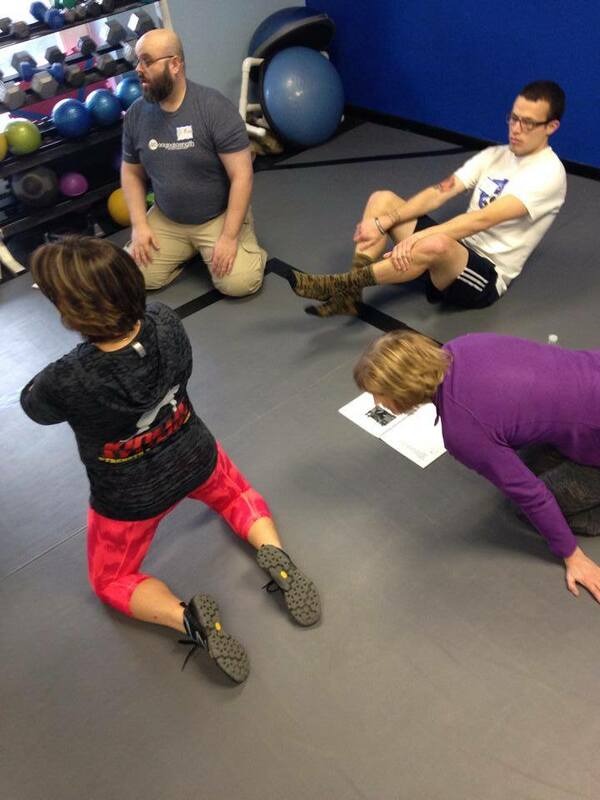 The second weekend was spent with the Original Strength team for a Level II OS workshop on using OS for assessment. All the resets we do in class come from the Level I OS courses I have taken in the past. This two day workshop was also really valuable to me and you can thank OS for all the anterior neck work we are currently doing in class. I also made some connections with people that will result in future opportunities to improve movement in my clients, especially those with scars which can hamper movement in ways we sometimes don’t consider. There will be more to come on that in the fall. I always feel rejuvenated after working with so many great people out there who are all doing things to help people move and feel better. Thanks for letting me work with you to help you to move and feel better. Does your coffee break look like this? If so, this reminder is for you. As we are in the midst of holiday baking and parties with lots of sugary options, it is good to remember some important things about what all that sugar is doing to your body. Every time you eat sugar, your immune system is supressed for hours afterwards. That is especially important to know with all the crud going around right now. It’s hard to get enough sleep during some of the busiest weeks of the year and to remember to wash your hands more frequently and keep up with your stock of hand sanitizer without making it even easier for those nasty germs to take hold. Eating lots of sugar messes with your metabolism. It sends a signal to your body to store fat, so those fat free candies find their way to your fat cells no matter what the package says. Even things that aren’t normally fattening can become so when your body is primed to store everything. Here’s a typical scenario. You’re at an evening party and you’ve made healthy food choices thus far, even avoiding the special cookies brought in by a co-worker by hiding out in your office or decided not to eat until the party. Your brain by this point is having a hard time continuing to make good choices because it is tired. Exerting will power uses up energy in your brain. By the end of the day, there’s not much energy left. You cave… you know you do. Then you sample one of everything and go back for seconds and thirds of the things you really loved. There is a better way. Here’s the same day but with a game plan. If you know you’ll be having a big meal for dinner, eat 10 to 15 grams of protein every 2 hours throughout the day focusing on lean meats and veggies. Have a salad with chicken for lunch. Drink lots of water throughout the day. Then when it comes time for your dinner, you’ve kept your blood sugar level and won’t store all that food you eat for dinner as fat. If you are heading out for a party where the focus will be on dessert, have some fruit with breakfast and lunch, eat lean protein for snacks and drink plenty of water throughout the day. Have some good quality fats with your dinner. You will go to your party with your body feeling happy with your food choices, not desperate to hold on to everything you put into your mouth. You’ve made your food choices ahead of time so didn’t need to exert brain power to decide whether or not to eat something. Plus, since you didn’t starve yourself all day, you’ll be more likely eat just what you really enjoy. Just as importantly, when you do get to your party or dinner, enjoy it. This will be a lot easier to do if you’ve followed your game plan. And be aware that guilt can add those unwanted pounds just like pound cake. Great article in the Star Tribune today entitled “Building a stronger self“. The article is written about Harvard social psychologist Amy Cuddy. In 2012 she gave a TED talk on what she calls “power poses”. You can tell a lot about a person by how they carry themselves. Those that feel powerful stand tall, with shoulders back. Those who feel insecure or powerless curl in on themselves, slouching, crossing their legs and arms. The message she wants everyone to know is that when it comes to being and feeling powerful, how you carry yourself can change not only how others perceive you, but how you perceive yourself. She has studied these changes in her research and has discovered that just two minutes of standing or sitting in a power pose raised testosterone 20% in both men and women and lowered cortisol 25%. In other words, these poses left people feeling more powerful and less stress reactive — a great combination! One simple power pose is to stand like Wonder Woman, arms akimbo, as my daughter likes to say. So before your next presentation, test, social outing, spend two minutes (in a bathroom stall if need be) standing in a power pose. Even if you don’t feel powerful, her mantra is “Fake it ’til you become it”. Why am I writing about this? For one thing, if you haven’t watched Ms Cuddy’s TED talk, I highly recommend you do so. The other reason is that I see a parallel between her power poses and Original Strength resets we do in class. Resets can leave you feeling powerful in the same way. I bet research would show that the resets also raise testosterone and lower cortisol. So why do you need resets instead of just the 2 minute power pose? Because OS resets can physically make you stronger helping those power poses to feel completely natural. I don’t think you’d have to “fake it” if you’ve been doing resets. Not only will you feel stronger, you will be stronger! 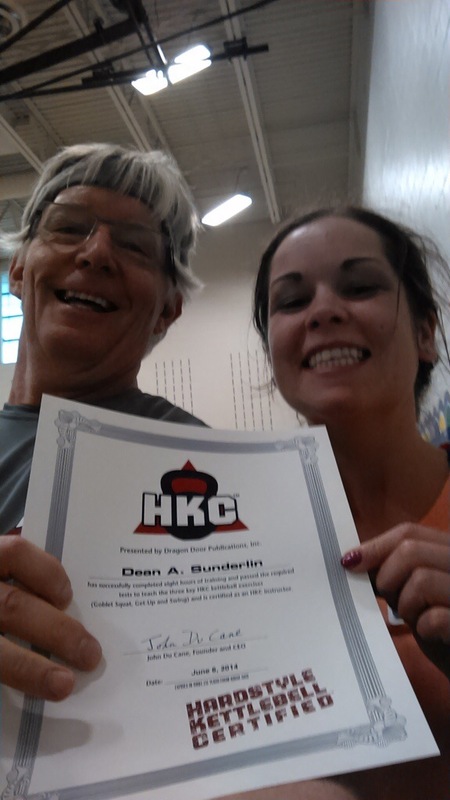 Dean Sunderlin and Nicole Smicek passed the HKC in June to become Certified Hardstyle Kettlebell Instructors. Make sure you congratulate them. They’ll be helping out at Forza! and filling in when I’m gone. Way to go Dean and Nicole!! !